The Best Part of their lives is now available for Adoption. Gentled Mustangs. Good Morning! It’s Wednesday! Yay. 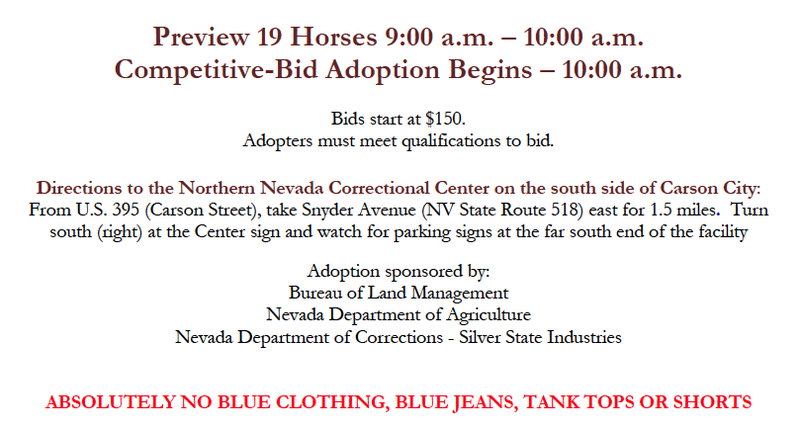 OK, well the title may be misleading because I want to speak about Inmate Gentled Mustangs that are ready for adoption. I know what many of you might be thinking right now as I thought that too – an inmate? Won’t they just womp on a poor mustang? These thoughts are exactly why I went to an Inmate Gentled Adoption 2 years ago. I was all ready to be up -in-arms about putting poor, displaced mustangs in with wild inmates. But, I was wrong. I learned. These horses are the light of the inmates lives. Period. It was evident. The men had spent the last 3 months, 8 hours a day, 5 days a week with these horses… If you want to see an inmate cry, just adopt their horse. I saw so many weepy-eyed tough guys that my heart was sad for them. Clearly the men and the horses had effected one another. The experience had gentled them both. In case you were wondering, the inmates are not chosen willy-nilly. The trainer positions are coveted, guarded, and held with great respect. The program is run with excellent care and consideration for both the inmate and the Mustang. I met the head Wrangler/Chief of the Inmate Gentled Mustang program and I was totally impressed. He wasn’t some meathead tough guy who was going to ‘make these Mustangs behave’. He was a true horseman who wanted to do right by the American Mustangs who are withering away in holding pens. He knew if he could train the Mustangs, they would be infinitely more adoptable. So, he set up this program. My very last trepidation came to rest when I saw the line-up. I mean, sure, the head Wrangler had a way with the horses but what about the inmates? … Well, I walked outside and I saw all the horses and trainers waiting to perform. I looked at every horse and kept a watchful eye for the fleeting mouth twitch or tail twirl to let me know the horses were in pain or stress. It was at this point I realized that I was probably wrong about the whole thing. These horses needed to learn about men and the men needed to learn about themselves and they both needed to become better citizens. And, it was working. That was obvious to me. The sale went well. The Mustangs showed what they knew. Most were green. However, they all did the basics and some even knew a few tricks. After each horse’s little demonstration, the bidding began. Today I wanted to present to you the newest line-up of hopefuls. If you’ve ever wanted a Mustang but were afraid to get an older horse who wasnt’ trained or a young one that wasn’t trained, HERE IS THE BEST OF BOTH WORLDS! These are horses that are on the lower side of their prime years and they have been trained by only one person. Their history is evident. They were in the wild, rounded up and then gentled. So, hop a cheap flight to Reno or get in your car and come see this wonderful opportunity to adopt one of our own (before they are gone…). Oh, and the facility has an area where you can ride your new mount with the help of the trainer so your first ride can be a proper handoff. And, best of all, there are farms that will keep your Mustang for a few days while you go back and get your trailer. Or, there are transport vehicles ready to travel your horse to its new home. Won't you help us? Click here. Update Day! 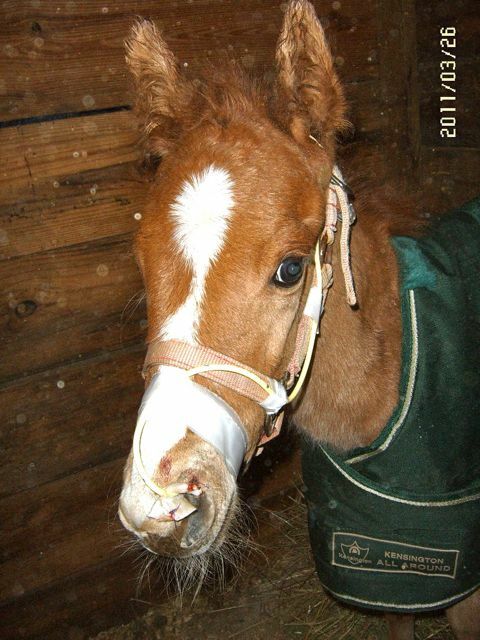 The Junkyard 4, The Diaper Foals and that baby donk all dried off! I’ll take Shilo, thank you. :-) Definitely not Terminator, for heaven’s sake! I would worry about him just a bit – he’s got a look in his eye like he’d look up to his name (and they even say “experienced rider” needed – I bet!). It still makes me sad to look at these guys. I would be bawling my head off watching the inmates part company with “their” horses for the last time.